If you need me, call me! - You don't know me. Sorry I've been missing, everyone. i've been sick. I hope you're all doing well! Also.. anyone have any idea where my phone might be? lol. Use your psychic abilities and comment if you know, because this is getting ridiculous. Kermit the Frog with the Lime in the Coconut. I love that video! Have you tried calling your phone from another phone? Hope you feel better. Now to think of a caption. . . It's off. :( So that isn't working. I'll look in there again. Thanks babe. "Miss American really lowered the bar"
Zoom in on my good side. Cinderella would have made it home before midnight if her Very Fairy Godmother hadn't insisted on taking prom pictures beforehand. LOL. That's hysterical. LOVE IT. "You're wearing a dress, Your Grace." Caption Contest: I'm never kissing a frog again! Haha, that's a great pic. ^_^ Have you had a chance to see my recent post with the wedding pics yet? Oops, that was me, of course. I have not, but I will. :) I haven't been feeling well so I'm way behind on my journal. Need to catch up. your phone? umm in the bed covers? i lose mine there all the time, lol. And close! I found it in the dirty laundry at the base of the bed. Caption 1: What photographers do when they can’t find a model. 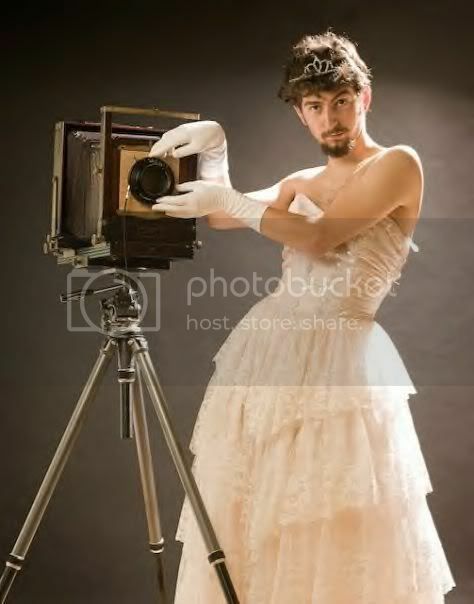 Caption 2: Johnny thought he’d have a better chance of winning the drag queen contest if he selected his own camera angles. Caption 3: I told you I could make you laugh for the picture. Caption 4: Oh come on! It won’t take that much time to touch up in Photoshop! Caption Contest: What do you mean the chocolate syrup itches? Check your fridge...and your grocery bags. I found it among the dirty laundry, finally. lol. Glad I got it back though. Thank you!